Could the Samsung Galaxy A80 camera flip come to the Note 10 or Galaxy S11? Today, Samsung unveiled its newest slate of mid-range phones, and near the top is the Galaxy A80. In keeping with the company’s strategy, this phone debuts with a wild new feature – its suite of rear-facing cameras flip forward to take selfies with a slick mechanism – that may, one day, make it to flagships like the Samsung Note 10 or Samsung Galaxy S11. The A series is a proving ground for new features that could trickle up. Consider the Samsung Galaxy A9 (2018), which sat just below the flagship S series, and its world-first four cameras. Half made it into the Galaxy S10e, three in the S10 and S10 Plus, and all four are coming in the Samsung Galaxy S10 5G. 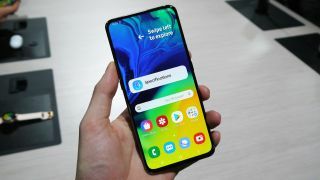 While the other mid-range phones Samsung debuted today have a more traditional look, the brand-new Galaxy A80’s rear-to-front flipping camera suite is a shrewd design strategy to preserve a seamless front display. The Samsung Galaxy S10 family inched closer to an unblemished screen with its ‘Infinity-O’ punch-hole design, but that’s still an awkward compromise, especially with the two-lens-wide oval on the Samsung Galaxy S10 Plus. Looks aside, there are other reasons to embrace the A80’s design trick -- who doesn’t want an ultra-wide camera taking expansive selfies? The Google Pixel 3 is the best for wide selfies at the moment with its 97-degree field-of-view front-facing lens, but imagine what you could do with the A80’s 123-degree FoV shooter – ostensibly the same as that in the S10 series, which captured impressive peripheral area in its ultra-wide shots. But will this rear-to-front flipping camera suite make it to the upcoming Galaxy Note 10 and next year’s Galaxy S11? Maybe – but more likely in a pared-back, more conservative form. There’s too much at stake with flagship phones for inventive gimmicks to be taken seriously, but that doesn’t mean they won’t influence future design. The moment we saw the A80’s cool flipping mechanism, we only had one question: how long until it breaks? Moving parts are stress points for failure, especially in personal gadgets that get opened and closed so often – let alone bumped, jostled and dropped. That’s doubly-true of the A80’s setup, which has two moving segments: a panel that rises up above the top of the phone and the flipping camera suit. Perhaps it won’t be a fall that disables the whole selfie shebang – perhaps it’ll just be grains of sand in the wrong place or a drink spilled in the mechanism. But in all honesty, that’s probably something Samsung is willing to risk. The A80 has respectable specs and a good camera, but at a (still unannounced) mid-range price, it’s a phone people can afford to run down in a year or two. Not so much with flagship phones and their skyrocketing prices, which have led them to become multi-year investments. You can see how this has stifled top-tier smartphone design into the same conservative rectangular boxes with cameras on either side. If you’re going to spend a ton of money on a handset, you want it to look sophisticated, high-quality and solid. Breakable features scare consumers. So...it’s probable that a flippable camera suite won’t make it into Samsung’s flagships. But the Infinity-O punch-hole in the S10 series is a good indication that the phone maker is willing to try radical departures from conventional design logic to achieve ever-higher screen-to-body ratios. So it wouldn’t be too surprising if Samsung went through great pains to develop a less radical mechanism that kept the front display unblemished by camera holes while still keeping selfie shot quality high. What that will be, well...that’s tough to guess. Other phonemakers have tried to skirt the notch by relocating the front-facing cameras to a periscope that pops up from the frame (as in the Vivo Nex and Oppo Find X) or by sliding the entire front half of the phone down to expose a suite of embedded lenses in the rear half (as in the Xiaomi Mi Mix 3). The A80’s solution is more complex, but admittedly classier than the others. If future Samsung flagships could improve on their functionality – perhaps by swiveling each lens on a column? Perhaps by flipping the whole suite vertically until it faces front? These solutions are obviously more complicated than the A80’s setup, but radical designs may be necessary to accommodate the push for less and less bezel on front displays.